The passion for law may be flowing through her veins, but SACCI 2013 Woman in Business and Entrepreneur Awards finalist – and Oslo Business for Peace Award nominee — Jolène Leeuwner-Maritz is a diverse entrepreneur with an interest in a variety of industries. The key to her success is a keen sense to spot a good opportunity and turn it into a successful business venture. 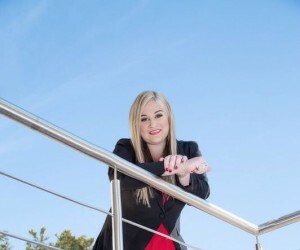 Leeuwner-Maritz, the youngest daughter of an advocate, currently specialises in property law, and manages her legal practice, Leeuwner Maritz Attorneys Notaries and Conveyancers – which she started at the young age of 26 – with her attorney husband, Jan Maritz. Besides her law degrees, she also holds a certificate in graphic design from the University of Cape Town, a certificate in digital marketing through the University of Stellenbosch, has completed a course in glass blowing through the Glass Forming Academy, and is currently studying Information and Communication Technology Law at the University of Pretoria. As if her law career and busy family life does not keep her busy enough, Leeuwner-Maritz also proudly owns a range of other companies in Johannesburg. Leeuwner-Maritz, who was a provincial chess player and a JKA SA championship karate medallist in her day, made time in her busy schedule to talk to us about South Africa’s legal system, seizing opportunities and her endless passion for learning. How effective is our legal system when it comes to property law? I believe we have a very secure land registration system — one of the best developed systems globally. I have recently visited New York City and, although I was impressed with their efficiency and speed, I still believe our registration system is very thorough. What are some of the milestones that women have achieved in your occupation over the past 20 years? It has become commonplace that women are not only appointed as judges of the High Courts, but that they serve with distinction. The same applies to managerial and senior positions in other branches of the legal profession. What changes in South African property law should every business owner know about? There are currently some proposed legislation affecting the field of immovable property ownership which could impact individuals and businesses throughout South Africa. The Expropriation Bill aims to replace the current expropriation legislation and some changes include that the market mechanism for compensation, which is currently the ‘willing buyer, willing seller’ principle, may be circumvented by the new bill. According to Minister of Rural Development and Land Reform, Gugile Nkwinti, the Spatial Planning and Land Use Management Act is premised on a transformative spatial vision to achieve spatial equity, integration, sustainability, good land administration and efficiency in order to create spatial justice. Some are of the opinion that the act will bring us closer to centralised state control of land and land use. The Land Management Commission Bill will establish a Land Management Commission, which will be put to task to maintain a government data base of all land registered or unregistered, in the name of a state department. This commission will decide disputes that may arise where there are two or more title deeds to the same property. The question is posed whether the commission will have a conflict of interest where it, as an organ of the state, can decide on title deeds where ownership of private individuals and the state overlaps. The Rental Housing Amendment Bill could propose additional expenses for investors letting their investment properties. They are proposing a rental housing tribunal to facilitate disputes between tenants and owners. What exactly does property law entail, and can you give us an idea of the major areas it covers? Property law involves much more than just real estate. Other acts and areas of the law that a property law practitioner will encounter include, but are not limited to, the Matrimonial Property Act, Companies Act, Insolvency Act, Housing Consumers Protection Measures Act, capital gains tax, the Trust Property Control Act, intestate succession, the Removal of Restrictions Act, the Share Block Controls Act, the Municipal Systems Act, time share, the Children’s Act, building restrictions next to roads, mineral rights, financial intelligence, the Civil Unions Act, the Immigrations Act, land survey, the Development Facilitation Act, the National Credit Act, the Consumer Protection Act, lease hold and upgrading of land tenure rights, less formal township development, the restitution of land rights, and the extension of security of tenure. Why is it important for businesspeople to be aware of their rights when it comes to property law? Immovable property often comprises the major part of a business’s asset portfolio. Therefore it is imperative for a business owner to be aware of legislation that could affect his/her rights toward his/her property and other assets. To be part of the progression of our species. Most of the time it is through the rule of law. But I appreciate evolution in all spheres and would be involved if at all possible. What other business interests do you have outside the legal profession? Together with my business partner, Bongi Majola, I have started Bon-Jole Salon. It was a viable business opportunity with the right able partner. Besides that, I have launched Jolè Designs. The company is inspired by both my mother and my children. It includes Jolè Printed (products developed into different ranges of printed artwork), Jolè Corporate (a range of corporate gifts), Jolè Luxury (a luxury beauty range), Jolè Exclusive (exclusive gifts, consisting of original paintings to hand-painted pottery and more) and Jogi Designs (a children’s range, designed by my two children).